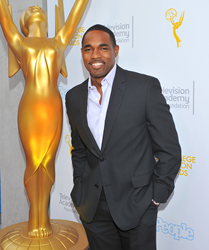 Actor Jason George (Grey’s Anatomy/Station 19) kicked off a Prizeo online sweepstakes today (prizeo.com/EMMYs) in which one lucky TV fan and their guest will win a VIP trip to Los Angeles to attend the 70th Emmy® Awards. Established in 1959 as the charitable arm of the Television Academy, the Television Academy Foundation is dedicated to preserving the legacy of television while educating and inspiring those who will shape its future. Through renowned educational and outreach programs such as The Interviews: An Oral History of Television, Power of TV, the College Television Awards and the Internship Program, the Foundation seeks to widen the circle of voices our industry represents and to create more opportunity for television to reflect all of society. For more information on the Foundation, please visit TelevisionAcademy.com/Foundation. Prizeo, an online sweepstakes-for-good platform, mobilizes celebrity fan bases by offering the chance to “give small and win big” while raising funds and awareness for charitable causes around the globe. Prizeo campaigns have featured celebrities such as Lin-Manuel Miranda, Ellen DeGeneres, Tom Brady, Martha Stewart, Imagine Dragons, Tyler Oakley, Lady Gaga and many more. To date, Prizeo has raised more than $50 million for hundreds of charities, including Planned Parenthood, American Cancer Society, United Way Worldwide, and Special Olympics. Prizeo is a member of Charity Network. Named one of Fast Company’s 2017 Most Innovative Companies, Charity Network is also parent company to Charitybuzz, an online charity auction platform; Chideo, a cause-meets-entertainment content company; and Global Philanthropy Group, a strategy consulting firm for cause. To learn more, please visit http://www.prizeo.com.